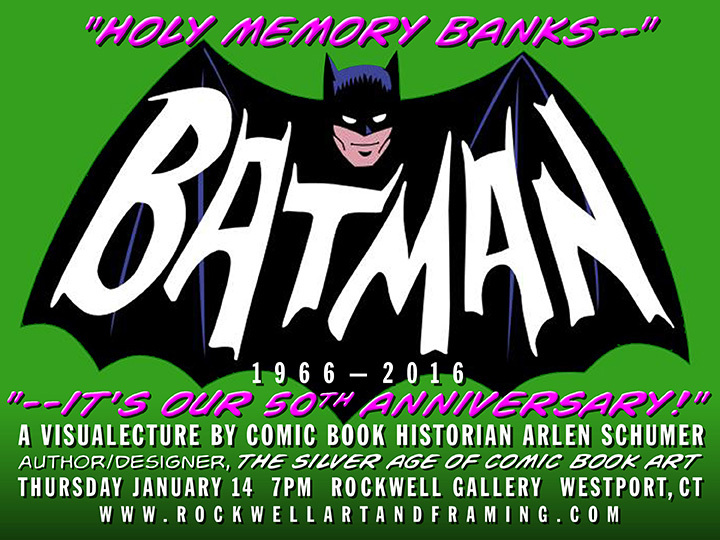 Arlen Schumer’s latest lecture celebrates the 50th anniversary of Batman ’66. Arlen’s a regular contributor around these parts — see his recent tribute to George Reeves’ Superman, for example — but you gotta see him in person if you can. Arlen’s kinetic style will lend itself well to a presentation on this show, I’m certain. For more info, click here. And make sure you check out Arlen’s website, where you can get his outstanding coffee-table book about the Silver Age. Just click here. I’ll be presenting my Bat-talk exactly 2 days after the EXACT 50th Anniversary of the show’s debut on 1/12/66!